Frank Dempsey was born in Dothan, Alabama and went on to play college ball at Florida from 1946-49. Dempsey was drafted in the 13th round (166th overall) of the 1950 NFL college draft by the Chicago Bears. Dempsey went on to play four years in the NFL (1950-53) with the Bears before coming to the CFL. 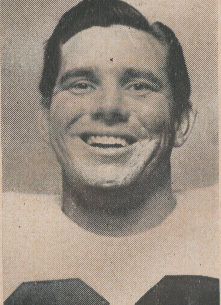 Hamilton signed Dempsey for 1954, and he started the 1955 season with them before being picked up by the Ottowa Rough Riders midway through 1955. In 1955, played for the East in the first Shriner's All-Star game and was named an East All-Star at linebacker. Dempsey remembers taht he always had wanted to be a running back, but always got slotted into a lineman position because of his size (6.03 and 235 pounds as a pro). Dempsey was fast though for a big man and was clocked atg 10.5s over 100 yards. After leaving football, Dempsey remained in Canada and started a firearms importing business. He continues to live in Ottawa. No official games played stats were kept in the East until 1960.